Elizabeth Kenny (20 September 1880 – 30 November 1952) was a self trained Australian Bush nurse who developed a controversial new approach for treating victims of poliomyelitis. Her method differed from the then conventional medical practice which called for placing affected limbs in plaster casts. Instead Kenny applied hot compresses to affected parts of patients' bodies followed by passive movement of those areas to reduce what she called "Spasm". Kenny's principles of muscle rehabilitation became the foundation of physical therapy, or physiotherapy. Her life story was told in the 1946 film Sister Kenny, portrayed by Rosalind Russell, who was nominated for the Academy Award for Best Actress for her performance. 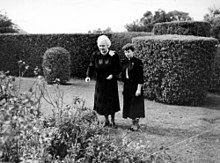 Elizabeth Kenny was born in Warialda, New South Wales, in 1880, the daughter of Australian-born Mary Kenny, née Moore, and Michael Kenny, a farmer from Ireland. She was called "Lisa" by her family and was home-schooled by her mother before attending schools in Guyra, New South Wales, and Nobby, Queensland. At age 17, she broke her wrist in a fall from a horse. Her father took her to Aeneas McDonnell, a medical doctor in Toowoomba, where she remained during her convalescence. While there, Kenny studied McDonnell's anatomy books and model skeleton. This began a lifelong association with McDonnell, who became her mentor and advisor. Kenny later asserted that she became interested in how muscles worked while convalescing from her accident. Instead of using a model skeleton, since they were available for medical students only, she made her own. Following her time with Dr. McDonnell, Lisa was certified by The Secretary of Public Instruction as a teacher of Religious Instruction and taught Sunday School in Rockfield. Having become a self-taught and good pianist she listed herself as "Teacher of Music" and taught music a few hours a week. In 1907, Kenny returned to Guyra, NSW, first living with her grandmother and then with her cousin Minnie Bell. She soon became a successful broker of agricultural sales between Guyra farmers and northern markets in Brisbane. Following that she worked in the kitchen in "Scotia", local midwife's cottage hospital and local Dr. Harris gave her a letter of recommendation. With part of her savings from her Brokerage work she paid a local seamstress to make her a Nurse's uniform. With that, and the observations she had at Scotia and from her time with Dr. Harris she returned to Nobby to offer her services as a Bush Nurse. At that time she was known as Nurse Kenny; she earned the title "Sister" while nursing on cargo ships which carried soldiers to and from Australia and England during WW I. In Britain and Commonwealth countries, "Sister" as a title of courtesy applies not only to members of a religious order but also to a more highly qualified nurse, one grade below "Matron". After her 1909 return to Nobby she worked as a bush nurse reaching her patients on foot and often by horseback. Soon she opened a Cottage Hospital at Clifton which she named St. Canices, where she provided convalescent and midwifery services. In 1911 she treated what Dr. McDonnell thought was infantile paralysis, under the supervision of Dr. Horn, the local Lodge Doctor. The story was romanticized in the 1946 film Sister Kenny, featuring Rosalind Russell. In her autobiography Kenny wrote that she sought Dr. McDonnell's opinion. He wired back, "...treat them according to the symptoms as they present themselves". Sensing that their muscles were tight, she did what mothers around the world did: applied hot compresses made from woollen blankets to their legs. Kenny wrote that a little girl woke up very much relieved and said, "Please, I want them rags that well my legs". Several children recovered with no serious after effects. There were several published versions of this story, one in Victor Cohn's 1975 biography, one in Ostenso's and one in Kenny's hand-written autobiography. The most dependable one, however, is most likely in a letter to Victor Cohn from Toowoomba journalist T. Thompson. Many years passed before Kenny treated anyone else who might have had polio. In 1915, Kenny volunteered to serve as a nurse in the war. She was not officially a qualified nurse. Nevertheless, nurses were badly needed so she was assigned to work on "Dark Ships", slow moving transports that ran with all lights off between Australia and England. They carried war goods and soldiers one way and wounded soldiers and trade goods on the return voyage. Kenny served on these dangerous missions throughout the war, making sixteen round trips (plus one around the world via the Panama Canal). In 1917 she earned the title "Sister", which in the Australian Army Nursing Corps is the equivalent of a First Lieutenant. Kenny used that title for the rest of her life. She was criticized by some for doing so, but Kenny was officially promoted to that rank during her wartime service. During the final months of the war, she served for a few weeks as Matron in a soldiers' hospital near Brisbane. She was unwell and worn down from her wartime duty, was honorably discharged and qualified for a pension. In April 1925, Kenny was elected as the first president of the Nobby branch of the Queensland Country Women's Association . Press reports from Australia during the 1930s quote Kenny as saying she developed her method while caring for meningitis patients on troopships during World War I. Although exhausted by her war service, Kenny set up and supervised a temporary hospital in Nobby to care for victims of the 1918 flu pandemic. When the epidemic subsided, Kenny traveled to Guyra to recuperate. Still exhausted and sick, she decided to go to Europe where doctors did help. Then she returned to Nobby, but within days she was summoned to Guyra by a girlhood friend to care for her daughter Daphne. The girl was disabled with what was known then as cerebral diplegia. Kenny treated her on the Cregan's Station west of Guyra for three years and continued her association with her for many years. Her treatment of Daphne, plus nursing of sick and wounded men during World War I provided Kenny the experience for her later work rehabilitating polio victims. Instead of settling down at home as a spinster caring for her mother, Kenny continued to work as a nurse from their home. Her neighbor Stan Kuhn took her to her patients in his motorcycle sidecar or automobile. When his daughter Sylvia fell into the path of his horse-drawn plow, he carried her home and called Kenny. She quickly improvised a stretcher from a cupboard door for badly injured Sylvia, carefully secured her to it and rode with her in the local ambulance 26 miles to Dr McDonnell's office. He helped Sylvia recover, and credited Kenny for her stretcher and her careful care. She improved the stretcher for use by local ambulance services and, for the next three years, marketed it as the "Sylvia Stretcher" in Australia, Europe and the United States. She turned the profits over to the Australian Country Women's Association, which administered its sales and manufacturing. At that time Kenny, because she would be traveling selling the Stretcher, adopted eight year old Mary Stewart to be a companion for Mother Kenny. Mary later became one of Sister Kenny's best "Technicians". When sales of the Sylvia Stretcher declined, Kenny returned to Nobby to again work as a nurse. During one of her sales journeys she met the Rollinson family who owned a Station west of Townsville. In 1931, during a trip to visit her brother Will, Kenny telephoned them. They promptly asked her to care for their niece Maude, who was disabled by polio. After 18 months under Kenny's care Maude was able to walk, return to Townsville, marry and conceive a child. The newspapers in Townsville took up the story, referring to it as a cure. In 1932, Queensland suffered its highest number of polio cases in 30 years; the following year, several local people helped Kenny set up a rudimentary polio-treatment facility under canopies behind the Queens Hotel in Townsville. In a few months (after further success with local children), she moved into the bottom floor of the hotel. The first official evaluation of Sister Kenny's work took place in Townsville in 1934, under the auspices of the Queensland Health Department. Her success working with polio victims led to the establishment of Kenny clinics in several cities in Australia. The Sister Kenny Clinic in the Outpatients Building of the Rockhampton Base Hospital is now listed on the Queensland Heritage Register. During these years, Kenny developed her clinical method and gained recognition in Australia. She was adamantly opposed to immobilising children's bodies with plaster casts or braces. At this time, Kenny requested that she be permitted to treat children during the acute stage of the disease with hot compresses (as she claimed to have done in Clifton before the war). However, doctors would not allow her to treat patients until after the acute stage of the disease, or until "tightness" (Kenny used the word "spasm" much later) subsided. She instituted a carefully designed regimen of passive "exercises" designed to recall function in unaffected neural pathways (much as she had done with Maude). On her own, she began treatment of a patient in the acute stage in her George Street Clinic in Brisbane, afterwards transferring her to the Ward 7 Polio Clinic in Brisbane General Hospital. That child (and others) recovered with fewer aftereffects than those placed in braces. In 1937, she published an introductory book about her work and began another,The Treatment of Infantile Paralysis in The Acute Stage,known as The Green Book which was later published in the United States. The most comprehensive appraisal of her methods, "The Kenny Concept of Infantile Paralyses And Its Treatment," was published in collaboration with Dr. John Pohl in 1943, and was known as "The Red Book.". Between 1935 and 1940, Kenny travelled extensively throughout Australia, helping to set up clinics. She also made two trips to England, where she set up a treatment clinic in St. Mary's Hospital near Carshalton Kenny's success was controversial; many Australian doctors and the British Medical Association (BMA) questioned her results and methodology. Raphael Cilento, who was in charge of the QHD evaluation, wrote a report that was somewhat complimentary but mainly critical. Kenny replied publicly, fiercely taking Cilento to task for his criticisms, unheard of then from a self-taught Australian Bush Nurse. This response caused a contentious relationship among Kenny, Cilento, the BMA and the Australian Medical Association (AMA). Between 1936 and 1938, a Queensland Government Royal Commission evaluated Kenny's work and published its Report of The Queensland Royal Commission on Modern Methods for the Treatment of Infantile Paralysis in 1938. Its most critical comment, because Kenny opposed using splints and plaster casts was: "The abandonment of immobilization is a grievous error and fraught with grave danger, especially in very young patients who cannot co-operate in re-education." They stated that her clinic (then in Brisbane) was "admirable". The Commissioners' strongest objections were against the Queensland government, which was funding Kenny's work, because her clinics were not supervised by BMA. The Queensland Government rejected the report, continuing to support Kenny's work. In 2009 as part of the Q150 celebrations, the Kenny regimen for polio treatment was announced as one of the Q150 Icons of Queensland for its role as an iconic "innovation and invention". During this time several Kenny treatment centers were opened throughout America; the best-known were the Sister Kenny Institute in Minneapolis (now Courage Kenny Rehabilitation Institute), a facility in the New Jersey Medical Center and her favorite, the Ruth Home in El Monte, California. She received honorary degrees from Rutgers University and the University of Rochester. She joined U.S. President Roosevelt (a well-known polio victim) for lunch, discussing his treatment at Warm Springs. 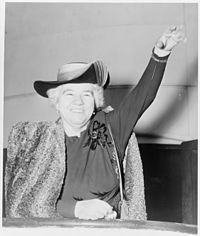 In 1951, Kenny headed the Gallup's most admired man and woman poll most-admired women's list, the only woman in the first 10 years of the list to displace Eleanor Roosevelt for the #1 spot. The Sister Kenny Foundation was established in Minneapolis to support her and her work throughout the United States. Some doctors changed their initial professional skepticism when they saw the effects Kenny's method had on her patients (both children and adults). Many American magazines covered her work. In 1975 Victor Cohn wrote the first detailed biography of her life and work. During her first year in Minneapolis, the National Foundation for Infantile Paralysis (NFIP) paid her personal expenses and financed trials of her work. That support ceased, however, after a series of disagreements with the NFIP Director. Kenny was a determined and outspoken woman, which harmed her relationship with the medical profession. Nevertheless, her method continued to be used and helped hundreds of people suffering from polio. In recognition of her work, in February 1950 President Harry Truman signed a Congressional bill giving Kenny the right to enter and leave the US as she wished without a visa. This honour had only been granted once before, to French marquis Gilbert du Motier, Marquis de Lafayette, who was a leader in the American War of Independence. Kenny filled her final years with extensive journeys in America, to Europe and Australia in an effort to gain further acceptance of her method. She tried, unsuccessfully, to have medical researchers agree with her that Polio was a systemic disease. She attended the second International Congress about polio in Copenhagen. There she was shunned and unable to participate. Suffering from Parkinson's disease, on her way home she stopped in Melbourne to meet privately with internationally respected virologist Sir Malcolm Burnett. He wrote about the visit in his autobiography. She had treated more cases than anyone else in the world – she gave the precise number, 7,828 – and no on else was in the position to speak with her authority. She is now almost forgotten by the world. But there was an air of greatness about her and I shall never forget that meeting. In a desperate attempt to save her life, Dr Irving Innerfield of New York sent his new experimental drug, Trypsin by air mail to Brisbane. It was then rushed by car to Toowoomba. Although the drug was administered on 29 November 1952, her doctor believed Kenny was too close to death to benefit from it, and she died the following day. 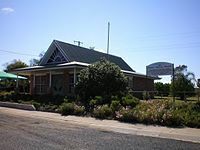 Kenny's funeral was held on 1 December 1952 at the Neil Street Methodist Church in Toowoomba, and was recorded for transmission in other parts of Australia and in the United States of America. The funeral cortege from the church to Nobby Cemetery was one of the largest seen in Toowoomba. Kenny was buried beside her mother in Nobby Cemetery. Between 1934 and her death in 1952, Kenny and her associates cared for thousands of patients, including polio victims throughout the world. Their testimony to Sister Kenny's help is part of her legacy, as is The Kenny Concept of Infantile Paralysis, and Its Treatment (known as the "Red Book" and written by Dr. John Pohl in collaboration with Kenny). 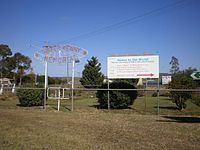 The Sister Kenny Memorial House was opened in Nobby on 5 October 1997 by Prof John Pearn. The memorial house contains many artefacts from Kenny's life, a collection of documents from her private correspondence, papers and newspaper clippings. In Toowoomba, the Sister Elizabeth Kenny Memorial Fund provides scholarships to students attending the University of Southern Queensland who will dedicate themselves to work in rural and remote areas of Australia. In Townsville, her life was commemorated in 1949 by the unveiling of the Sister Kenny Memorial and Children's Playground. Cartoonist and amputee Al Capp was involved with the Sister Kenny Foundation during the 1940s and 1950s. As honorary chairman, Capp made public appearances on its behalf, contributed artwork for its annual fundraising appeals and entertained disabled children in hospitals with pep talks, humorous stories, and sketches. Alan Alda credits the Sister Kenny treatments he received from his mother as a young boy for his complete recovery from polio, stating in his autobiography Never Have Your Dog Stuffed that he has no question about their efficacy. In an interview with the Actors Studio, the actor Martin Sheen recounted that he contracted polio as a child and it was only due to his doctor using Sister Kenny's method that he regained use of his legs. Peg Kehret (née Schulze), American author. Kenny, Elizabeth, Infantile Paralysis and Cerebral Diplegia: Method of Restoration of Function (Sydney: Angus and Robertson, 1937). Kenny, Elizabeth, The Treatment of Infantile Paralysis in the Acute Stage, (Minneapolis–St. Paul, Bruce Publishing Co. 1941). Kenny, Elizabeth, My Battle and Victory: History of The Discovery of Poliomyelitis as a Systemic Disease, (London: Robert Hale, 1955). Ostenso, Martha and Kenny, Elizabeth, And They Shall Walk, (Bruce Publishing Co, Minneapolis-St Paul 1943). Pohl, John, MD, and Kenny, Elizabeth, The Kenny Concept of Infantile Paralysis and Its Treatment, (St. Paul: Bruce Pub. Co. 1943). Rogers, Naomi, Polio Wars: Sister Kenny and The Golden Age of American Medicine, (Oxford University Press, N.Y. 2014). Alexander, Wade, Sister Elizabeth Kenny: Maverick Heroine of The Polio Treatment Controversy, (Greystone Press, San Luis Obispo CA 2012). Note: This is an unredacted edition which includes content not in the Outback Press/CQU 2003 Edition which is out of print. The book is now Published by the Sister Kenny Memorial House in Nobby QLD, AU. The Greystone 2012 Edition is available in an electronic version from the author. ^ a b Patrick, Ross (1983). "Biography – Elizabeth Kenny". Australian Dictionary of Biography, Volume 9. Archived from the original on 14 June 2014. Retrieved 6 June 2014. ^ Kenny, E. 1943. And They Shall Walk. New York: Dodd, Mead. ^ a b c d e Cohn, V. (1975) Sister Kenny: The woman who challenged the doctors. Minneapolis: University of Minnesota Press. ^ "COUNTRY WOMEN'S ASSOCIATION". The Brisbane Courier (20, 986). Queensland, Australia. 29 April 1925. p. 23. Retrieved 1 January 2019 – via National Library of Australia. ^ Sydney Morning Herald, "Paralysis. A new system of treatment", 16 February 1935, p.15. ^ "Rockhampton Hospital – Therapies Block and Medical Superintendents Residence (entry 601967)". Queensland Heritage Register. Queensland Heritage Council. Retrieved 1 August 2014. ^ Kenny, E. (1941) The treatment of infantile paralysis in the acute stage. Minneapolis: Bruce Publishing Co.
^ Pohl, J. F. and Kenny, E. (1943) The Kenny Concept of Infantile Paralysis And Its Treatment. Minneapolis: Bruce Publishing. ^ Report on the Muscle Re-Education Clinic Townsville; and the Work by Sister E. Kenny. "Summary of Facts." – James Cook University Library, Sister Kenny Archive. ^ The Medical Journal of Australia, Report of the Queensland Royal Commission on Modern Methods for the Treatment of Infantile Paralysis, 29 January 1938, I:5, 187-224. ^ Alexander, Sister Elizabeth Kenny: Maverick Heroine of the Polio Treatment Controversy, chapters 6-9. ^ Kenny, (15 May 1943). "Kenny Treatment of Poliomyelitis". British Medical Journal. 2 (4297): 615–616 (quote p.616). PMC 2282914. ^ George Gallup. "Mrs. Roosevelt again leads list of most admired women", The Dallas Morning News, 22 January 1956, page 12: "The one year since 1946 that Mrs. Roosevelt did not head the list was in 1951, when she ran second to Sister Kenny, internationally famous nurse who pioneered a treatment for polio." ^ "The remarkable saga of Elisabeth Kenny". Brisbane Telegraph. 1 December 1952. p. 5 (STUMPS). Retrieved 5 July 2017 – via National Library of Australia. ^ Alexander 2012. p.491, Burnett Bio, note 41, Heinemann, William, Changing Patterns, An Atypical Autobiography, Sir MacFarlane Burnett,(Melbourne, Sun Books Pty Ltd. 1970), 166-168. ^ "New Drug Being Flown from U.S. to Treat Sister Kenny". Queensland Times (20, 561) (Daily ed.). 28 November 1952. p. 1. Retrieved 5 July 2017 – via National Library of Australia. ^ "Flight For Sister Kenny". Truth (2749). Brisbane. 30 November 1952. p. 1. Retrieved 5 July 2017 – via National Library of Australia. ^ "SISTER KENNY BURIED NEAR MOTHER AT NOBBY". Brisbane Telegraph. 1 December 1952. p. 2 (STUMPS). Retrieved 5 July 2017 – via National Library of Australia. ^ "Sister Elizabeth Kenny". Monument Australia. Archived from the original on 1 January 2019. Retrieved 1 January 2019. ^ Actors Studio – Pace University. "Interview with Martin Sheen". YouTube. Inside the Actors Studio. Archived from the original on 12 March 2016. Retrieved 12 August 2015. 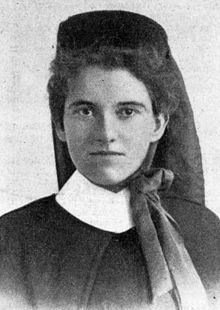 Alexander, W. Sister Elizabeth Kenny: maverick heroine of the polio treatment controversy (First Published by Central Queensland University Press 2003, now Published by Sister Kenny Memorial House Nobby, QLD) . ISBN 978-1-876780-24-1227 pages. Wikimedia Commons has media related to Elizabeth Kenny.